A catastrophic superflare from the sun, like the one in the year 775, would put astronauts at risk for lethal doses of radiation, new research suggests. This 2012 coronal mass ejection resulted in a solar flare aimed away from Earth. When a powerful "superflare" from the sun scoured the solar system more than 1,200 years ago, it apparently had little effect on Earth's inhabitants — but today's astronauts wouldn't be so lucky, scientists said. New research suggests that an event of that magnitude would greatly endanger current plans for space travel, with astronauts standing a good chance of receiving lethal doses of radiation. 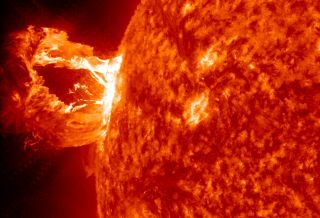 Solar eruptions occur regularly, sometimes wreaking havoc on Earth. For instance, in 1989, a powerful explosion from the sun hit the Earth's magnetic field, triggering a geomagnetic storm that blacked out the entire Canadian province of Quebec within 90 seconds, leaving 6 million residents in the dark for 9 hours. The event also damaged electrical transformers as far away as New Jersey, including one at a nuclear power plant, and nearly took down U.S. power grids from the Eastern Seaboard to the Pacific Northwest. The superflare of 775 was apparently mostly harmless on Earth, leaving few traces behind aside from in tree rings across the planet. However, researchers warned that if this event were to happen again, it could be disastrous for astronauts in space. "An event of this magnitude would likely be catastrophic if it were to occur during a transit in deep space, such as to Mars, unless substantial shielding is provided," said study lead author Lawrence Townsend, a radiation physicist at the University of Tennessee in Knoxville. The thin air of Mars would in theory provide some protection against cosmic radiation, depending on how much of the atmosphere astronauts had above them. However, Townsend and his colleagues estimated that at all elevations on Mars, the radiation dose that crews would receive would exceed all safety limits, boosting the risk that the astronauts would develop a fatal cancer. Radiation sickness would also be likely, and could include severe effects such as vomiting, diarrhea, hemorrhaging and death, the researchers said. Events like that of 775 "are infrequent, but possibly more frequent than once every thousand years or so," Townsend told Space.com. "We do know that an event comparable to the Carrington Event occurred in late October, early November 2003. The X-ray levels from this event were huge, beyond anything observed before or since." Fortunately, the event affected Earth only peripherally; the planet's experience was "similar to being near but not actually in the path of a Category 5 hurricane," Townsend said. These findings emphasize the importance of off-Earth "storm shelters" to help shield against such dangerous events, he said. "On the surface of Mars, or the moon for that matter, substantial shielding would be needed, probably in a cave or lave tube if such were available, and preferably at a location deep within the Martian atmosphere," Townsend said. Surface habitats on Mars might also best be located "in a narrow canyon, or next to a large cliff with an overhang — anything to reduce the exposed area through which particles could enter from deep space," Townsend added. Future research could explore how often such catastrophic events occur and investigate whether "there [are] clues warning us as to when they might occur," Townsend said. "My goal is neither to be an alarmist, or to sidetrack future human explorations in deep space. Instead, I hope to point out that prudence suggests that we better understand these events, their ramifications for future spaceflight and what is needed to protect crews from them." The scientists detailed their findings in the June-July issue of the journal Acta Astronautica.